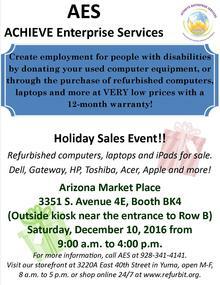 Past Events - ACHIEVE Human Services, Inc.
Join ACHIEVE Enterprise Services for a Holiday Sales Event at the Arizona Market Place, 3351 S. Avenue 4E, Yuma, AZ 85365, this Saturday, December 10, 2016 from 9:00 a.m. to 4:00 p.m.
Bring your computer and electronic recyling donations to the Foothills Tractor Supply (10637 East South Frontage Road) on Saturday, April 9 from 8 a.m. to 12 p.m. ACHIEVE Enterprise Services (AES) will be onsite to accept cell phones, hard drives, printers, monitors, keyboards, laptops, iPads, desktop computers, and much more. Please no CRTs or TVs. 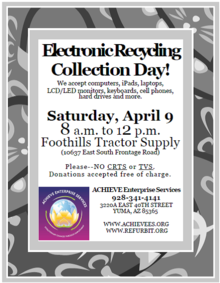 For more information, call AES at 928-341-4141. Please join ACHIEVE Human Services in celebrating the grand opening of ACHIEVE Enterprise Services. 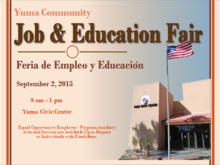 Saturday, January 9, 2016 from 10:00 a.m. to 2:00 p.m.
Join ACHIEVE Human Services, Inc. and our community partners at the Yuma Community Job and Education Fair on Wednesday, September 2, 2015 from 9:00 a.m. to 1:00 p.m. at the Yuma Civic Center, 1440 W Desert Hills Drive. 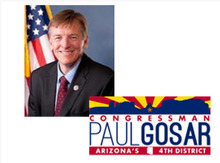 Congressman Paul Gosar will be in Yuma on Friday, May 8, 2015 to receive the Ability One Champion Award. An AbilityOne Champion is an elected federal policymaker who has demonstrated support for the AbilityOne Program and for related community-based nonprofit agencies in his or her district or state through congressional actions while supporting the enhancement of opportunities for economic and personal independence of persons who are blind or have other severe disabilities.